It's always exciting to import a new chicken breed into America, but if we're serious about saving breeds from extinction we need to think about how the breed will survive a decade...or centuries...in the future. If a breeding population is too small and isolated then inbreeding begins to exert its corrosive effects and the breed can dwindle to nothing. Disease resistance drops, birth defects become common, the size of the animals diminishes, and before too long a breed is hollowed out from within by inbreeding depression, a victim of its own insular genetics. That's why at Greenfire Farms we have an ongoing program to not only import new breeds, but to improve them over time by diversifying bloodlines and carefully selecting for desirable traits. This doesn't mean that every bird we hatch is perfect, but if done properly, it should mean that our breeding flocks improve over time. A case in point is our experience with cream legbars. Greenfire Farms is the importer of the first cream legbars into America, and the initial generation of breeding stock included a large, friendly rooster that was disease resistant and sired healthy chicks. He is, in essence, the father of our "A" bloodline of cream legbars. He had many positive traits and the few flaws he had were cosmetic: his comb was not as erect as called for in the written breed standard and, depending on whom you asked in England, he may have had a little too much chestnut color in his neck hackle feathers. This rooster sired a group of hens from which we selected the best for establishing a second breeding group. 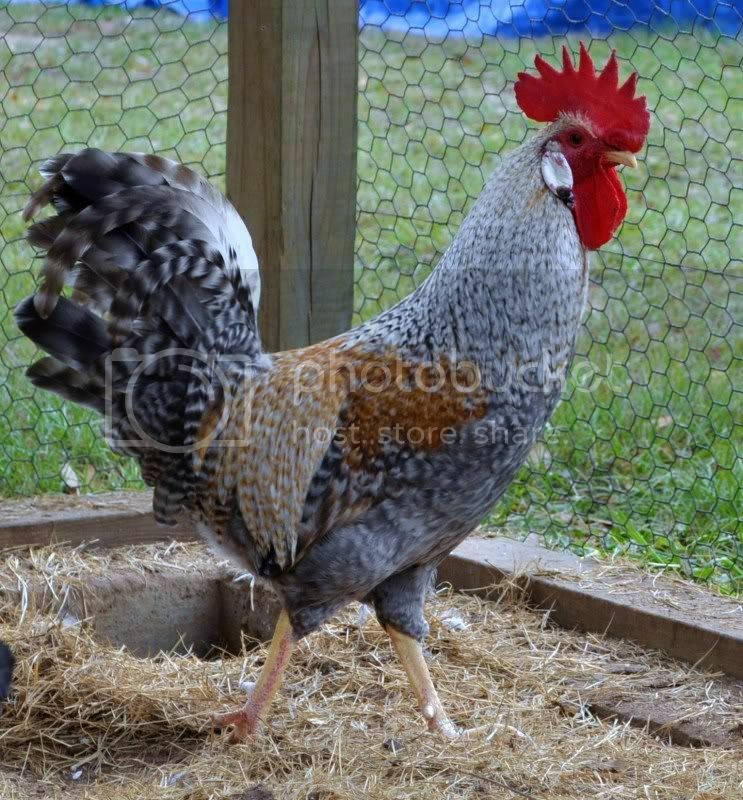 To this new breeding group we added a completely unrelated rooster --also imported from a UK bloodline-- that had traits that addressed the weaknesses in our original rooster. You can see him here with his more erect comb and less chestnut color in his neck hackle. In 2012, this rooster and his group of hens will produce chicks --our "B" bloodline-- that will once again be subjected to a rigorous selection process, and the best of these chicks will become breeders for 2013. Also, at some point in 2012 we plan to import an unrelated pair of cream legbars and introduce them into the breeding program at Greenfire Farms. We'll be looking for birds with bright yellow legs and clearly defined feather crests on their heads. They will be our "C" bloodline. By tracking the pedigrees of our birds, selecting for positive traits, and introducing newly imported bloodlines over time (although this comes at a high cost), we strive to continually improve our birds and keep them genetically diverse. Our commitment to these breeds is to import them, but also to improve their genetics over time so that eventually America is seen not only as a haven for these rare breeds, but as the place where the best examples of these breeds can be found. Imagine this bit of heresy: In twenty years poultry hobbyists in the UK are importing into their country cream legbars from America. (This is not a completely crazy notion: Today the Japanese are importing the best examples of Japanese breeds from Germany.) Who knows? It could happen if we can muster the commitment and discipline necessary to produce superior birds. This will be a time-consuming and expensive undertaking, but one that offers these breeds a promising future, and also one in which you can play a pivotal role.